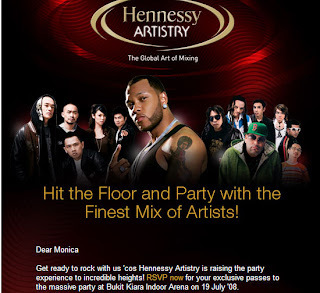 When I saw this, "Party in style with Hennessy Artistry on 19 July 08!‏" in my Inbox, I was like, wow! I guess it must be fun, at the very least. Come and be blown away by some of the world's finest mix of artists. Nothing less than the likes of Flo Rida, Machi, DJ Latin Prince, Pop Shuvit, and VJ Callen will be shaking it up at this mega-event! Have a listen to some of their hit singles right here , including "Elevator" feat. Timbaland and the No.1 hit single "Low" by Flo Rida. And don't forget to spice up your desktop with cool wallpaper and PC widgetry while you're at it! Is anyone going to the party? :( Too bad I wont be able to go since I'm here in KK! I miss KL already! Boohoooo!!! Sounds like the music will be pretty cool!